2014 was the 100th anniversary of the start of World War I, the supposed “war to end all wars”. Not true. Believe it or not 50 years before WW1 broke out, southern China was torn apart by an even bloodier conflict. Conservative estimates of the dead in the 14-year Taiping rebellion start at between 20 and 30 million. Around 17 million soldiers and civilians were killed during WW1. Although the great majority of casualties in WW1 were from the working class, the social and political elite was hit disproportionately hard by WW1. Their sons provided the junior officers whose job it was to lead the way over the top and expose themselves to the greatest danger as an example to their men. Some 12% of the British army’s ordinary soldiers were killed during the war, compared with 17% of its officers. Eton alone lost more than 1,000 former pupils – 20% of those who served. Because vast swathes of Europe lay wasted, millions were dead or wounded and the survivors lived on with severe mental trauma it is odd to talk about winning. However, in a narrow military sense, the UK and her allies convincingly won. Germany’s battleships had been bottled up by the Royal Navy until their crews mutinied rather than make a suicidal attack against the British fleet. 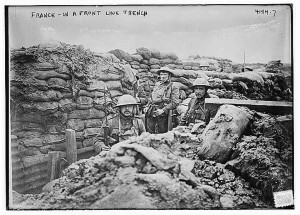 In 1918 once the deadlock of trench warfare had been broken Germany’s army collapsed as a series of mighty allied blows scythed through supposedly impregnable defences. By late September 1918 the German emperor and his military mastermind Erich Ludendorff admitted that there was no hope and Germany must beg for peace. The 11 November Armistice was essentially a German surrender. Unlike Hitler in 1945, the German government did not insist on a hopeless, pointless struggle until the allies were in Berlin – a decision that saved countless lives, but was seized upon later to claim Germany never really lost. The treaty of Versailles confiscated 10% of Germany’s territory but still left it the largest, richest nation in central Europe. It was largely unoccupied and financial reparations were linked to its ability to pay, which mostly went unenforced anyway. 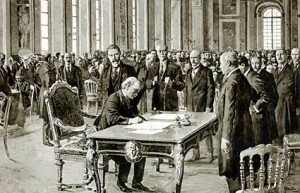 The treaty of Versailles was notably less harsh than treaties that ended the 1870-71 Franco-Prussian War and the 1940 French Surrender to the Nazis. The German victors in the both of these two wars annexed large chunks of two rich French provinces, which had already been a part of France for between 200-300 years. The industial cost was even higher when you consider that these 2 provinces are home to most of French iron ore production.